What to do with a Mexican vanilla bean? Why not a Groucho Marx impersonation? Even though I recommended adding it to a bowl of sugar for flavor. 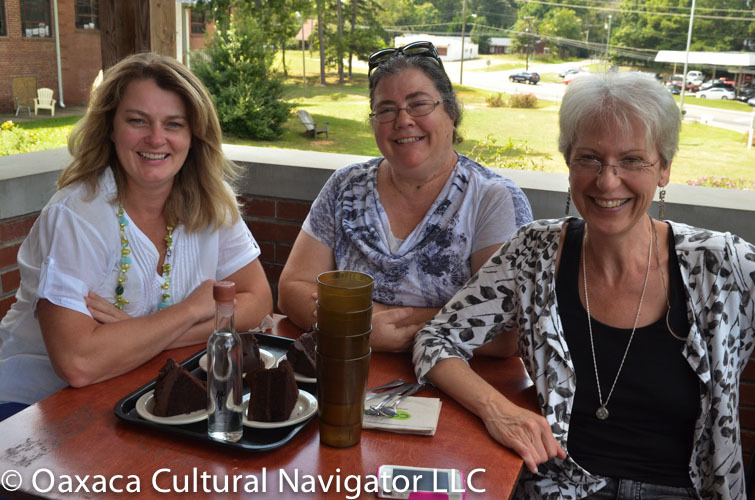 On Friday, we had a Women’s Creative Writing and Yoga Retreat mini-reunion at the Oak Leaf Restaurant in Pittsboro, NC. Who? Robin, Debbie, Becky and me. 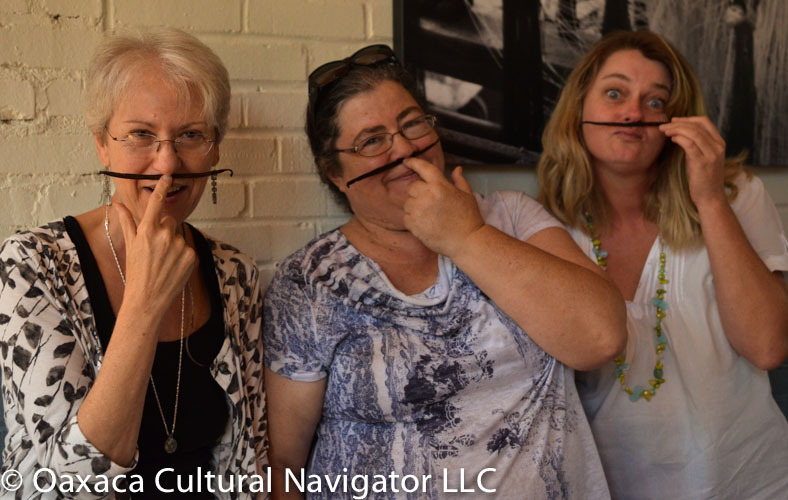 As soon as I presented my North Carolina friends — all professional women — with a gift of a Mexican vanilla bean, a maguey fiber facial scrub, and a package of tasty mango fruit leather, you can see what they did first. I’m not certain which one started it. This speaks volumes about the fun we have in Oaxaca during the retreat each year! And, there’s space for you. I also brought along a bottle of private label El Diablo y La Sandia madrecuixe sylvestre (wild) agave mezcal to open and share. This is only available for sale at the B&B in Oaxaca. The restaurant was to charge us a corkage fee, but their first question was, Where did you buy this? Oaxaca, I said, waiting for them to ask, How do you spell that? Oh, she said, wait a minute. Then the manager came over. We are really sorry, we can’t serve you this bottle. Though I’d love to taste it, she confessed. It has to have been purchased in an ABC (Alcohol and Beverage Commission) Store for us to legally open and serve it here. She was really, really apologetic, but we had another solution. After our delicious BLT lunch of a fried green tomato, goat cheese and bacon sandwich (minus the bacon for two vegetarians), we declined dessert at the Oak Leaf. We had something else in mind and went next door to the Chatham Market Place. This is our local organic grocery store and cafe. Here we bought vegan chocolate cake dessert for each of us, and took four tumblers outside to the picnic table, where we easily broke the wax seal on the bottle, twisted off the cap and poured. 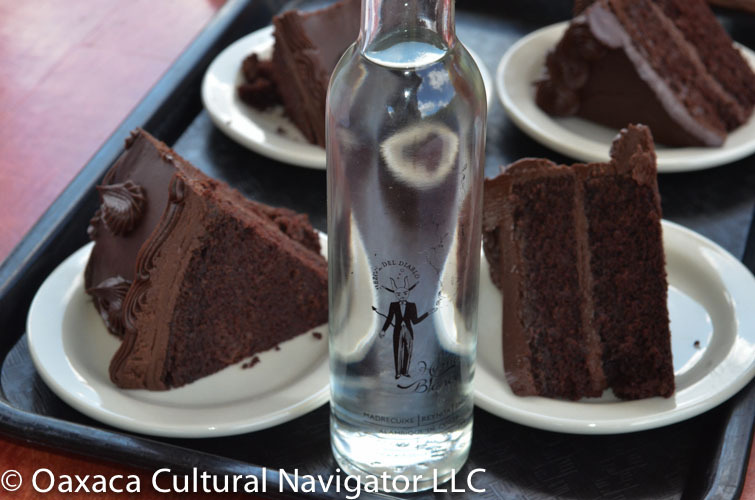 I have to confess, chocolate and this herbal earthy mezcal go really well together. We did NOT drink the entire bottle! Not even close. Just a little sip. But, most of us managed to finish the cake! Mexico’s gifts to the world include the vanilla bean, mezcal and the word for chocolate. Add to that mole, corn and colorfast cochineal. Anything else you can think of? 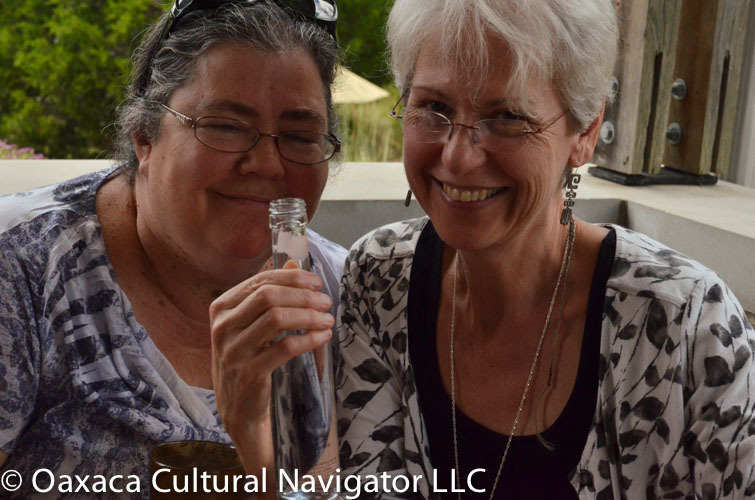 This entry was posted in Food & Recipes, Oaxaca Mexico art and culture and tagged Chatham County, Mexico, mezcal, North Carolina, Oaxaca, Pittsboro, retreat, vanilla beans, women's creative writing, workshop. Bookmark the permalink.